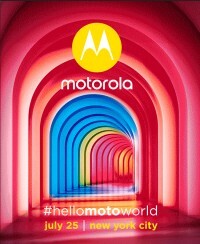 Motorola has sent out an interesting save-the-date to the press. The graphic shows a colorful tunnel with the text “you won’t want to miss this”. The bottom of the invite reads "#hellomotoworld" which likely indicates a global launch. By contrast, the Moto Z was announced and released in separate global events and a dedicated launch event, where Verizon pricing and availability was detailed. Motorola chose New York to showcase whatever it’s announcing on the 25th. Our hunch is that Motorola could even be launching two devices: both the Moto X4 and the Moto Z2, both of which have been discussed about in the news for the past couple of months or so in various spec leaks and render spills. Another plausibility is that the Moto X4 is the only smartphone being announced and that Motorola is saving the Moto Z2 launch for much later in September for IFA, though we don’t think this is as likely. 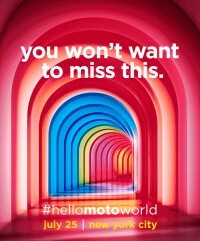 In any case, we’ll be waiting to see what Motorola is ready to show off in New York. Which phone are you more excited for? The Moto X4 or the Moto Z2? Yeah true but it is rumored that the g5 family will be getting an update to android 7.1.2 whenever they decide to release the g5s and g5s plus. Moto Z2 only if the rumor of X4 being released on Q4 is true. Announcing smartphone 3-4 months before selling doesn't work in this short attention span market and IFA will be the perfect time to introduce X4.